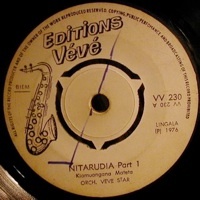 The main label for Verckys productions in the early to mid 1970s. The chronology of releases is a bit unclear from the limited information available. To find out more about Kiamuangana Mateta “Verckys”, read Rumba on the River by Gary Stewart (Verso, 2000). The image, left, is taken from Pieter’s Sea Never Dry blog and it’s a killer tune. Events have overtaken me since I started this discography as Alastair over at Muzikifan has posted a much fuller Editions Veve discography than this one. I recommend a visit.